In total, 32 players have reached the 3,000 hit mark in MLB history. Of these, 17 were right-handed batters, 13 were left-handed, and two were switch hitters, meaning they could bat from either side of the plate. Ten of these players have played for only one major league team. Six players—Hank Aaron, Willie Mays, Eddie Murray, Rafael Palmeiro, Albert Pujols and Alex Rodriguez—are also members of the 500 home run club. At .367, Cobb holds the highest career batting average among club members, while Cal Ripken Jr. holds the lowest at .276. Rodriguez, Derek Jeter, and Wade Boggs are the only players to hit a home run for their 3,000th hit and Paul Molitor and Ichiro Suzuki are the only players to hit a triple for their 3,000th; all others hit a single or double. Craig Biggio was thrown out at second base attempting to stretch his 3,000th hit, a single, into a double. Biggio and Jeter are the only players whose 3,000th hit came in a game where they had five hits; Jeter reached base safely in all of his at bats. The most recent player to join the club is Pujols, who collected his 3,000th hit on May 4, 2018, while playing for the Los Angeles Angels. Baseball writer Josh Pahigian writes that reaching 3,000 hits has been "long considered the greatest measure of superior bat handling", and it is often described as a guarantee of eventual entry into the Baseball Hall of Fame. All eligible players with 3,000 or more career hits with the exception of Palmeiro, whose career has been tainted by steroid allegations, have been elected to the Hall, and since 1962 all who have been inducted were elected on the first ballot, except for Biggio. Rose is ineligible for the Hall of Fame because he was permanently banned from baseball in 1989. After four years on the ballot, Palmeiro failed to be named on 5% of ballots in 2014, and accordingly his name was removed from the Baseball Writers' Association of America ballot for future elections, although it is possible that the Veterans Committee could select him. Twenty-one different teams have had a player reach 3,000 hits. 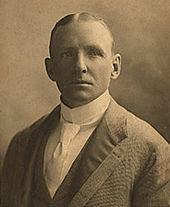 Cap Anson reached 3,000 hits on July 18, 1897, and was the first player to do so. In 1927, Ty Cobb became the first player to collect 4,000 hits. Paul Molitor was the first to triple for his 3,000th hit. 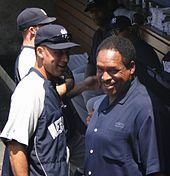 Derek Jeter (left) and Dave Winfield (right) are both members. Albert Pujols is the most recent member of the 3,000 hit club. Statistics are updated through April 22, 2019. ^ a b c Two major factors have confused Anson's precise hit total. First, a rule which existed for only the 1887 MLB season counted walks as hits. Additionally, Anson played five seasons in the National Association (NA), which is not always recognized as an official "major league". MLB.com credits Anson with 3,011 career hits, not including his time in the NA or his walks in 1887. Baseball-Reference credits him with 3,435 hits, including his time in the NA, not including his walks in 1887, and differing with MLB.com over his hit total in 1894. The Hall of Fame shows 3,081 hits for Anson, including his walks in 1887 (for a total of 224 hits that season) but not including NA playing time. Elias Sports Bureau also credits him with 3,081 hits. The date listed comes from MLB.com, using their hit totals for Anson. ^ a b MLB.com and the Hall of Fame credit Cobb with 4,191 hits, while Baseball-Reference lists 4,189. ^ This was not Clemente's last game, however, as he entered his next and final game as a defensive substitution and did not bat. Clemente died during the following offseason on December 31, 1972. ^ MLB.com credits Lajoie with 3,252 hits, while Baseball-Reference and the 3,000 hit club page on MLB.com list 3,243 and 3,242, respectively. "Career Leaders & Records for Hits". Baseball-Reference.com. Sports Reference LLC. Retrieved July 4, 2010. "3,000 Hits Club – Milestones". MLB.com. Major League Baseball. Archived from the original on June 24, 2010. Retrieved July 4, 2010. "The 3,000 Hit Club". National Baseball Hall of Fame. Archived from the original on March 25, 2010. Retrieved July 4, 2010. ^ a b Fleitz, David L. (2005). Cap Anson: The Grand Old Man of Baseball. Jefferson, North Carolina: McFarland & Company. p. 346. ISBN 0-7864-2238-6. ^ "Complete Baseball Team and Baseball Team Encyclopedias". Baseball-Reference.com. Sports Reference. Archived from the original on August 8, 2010. Retrieved July 4, 2010. ^ "Cap Anson – Historical Player Stats". MLB.com. Major League Baseball. Retrieved July 4, 2010. ^ "Cap Anson Statistics and History". Baseball-Reference.com. Sports Reference. Archived from the original on November 27, 2009. Retrieved July 4, 2010. ^ "Anson, Cap". baseballhall.org. Baseball Hall of Fame. Archived from the original on June 22, 2010. Retrieved July 4, 2010. ^ a b "The 3,000 Hit Club: Cap Anson". Baseball Hall of Fame. Archived from the original on October 29, 2016. Retrieved November 24, 2016. ^ "Progressive Leaders & Records for Hits". Baseball-Reference.com. Sports Reference LLC. Archived from the original on April 29, 2011. Retrieved July 4, 2010. 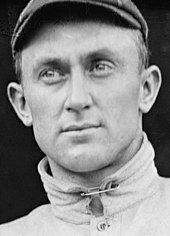 ^ "Ty Cobb Stats, Bio, Photos, Highlights". MLB.com. Major League Baseball. Archived from the original on November 3, 2012. Retrieved July 4, 2010. ^ "Cobb, Ty". baseballhall.org. Baseball Hall of Fame. Archived from the original on December 14, 2010. Retrieved July 4, 2010. ^ a b "Ty Cobb Statistics and History". Baseball-Reference.com. Sports Reference. Archived from the original on July 6, 2011. Retrieved July 4, 2010. ^ Constantino, Rocco (2016). 50 Moments That Defined Major League Baseball. Lanham, Maryland: Rowman & Littlefield. pp. 27–28. ISBN 978-1-4422-6055-9. ^ Boswell, Thomas (September 12, 1985). "'Charlie Hustle' gets hit 4,192 to surpass Cobb, then another". The Washington Post. ^ a b "Roberto Clemente 1972 Batting Gamelogs". Baseball-Reference.com. Sports Reference LLC. Archived from the original on November 10, 2012. Retrieved July 4, 2010. ^ "September 30, 1972 New York Mets at Pittsburgh Pirates Play by Play and Box Score". Baseball-Reference.com. Sports Reference LLC. Archived from the original on June 16, 2011. Retrieved July 4, 2010. ^ "October 3, 1972 St. Louis Cardinals at Pittsburgh Pirates Play by Play and Box Score". Baseball-Reference.com. Sports Reference LLC. Archived from the original on February 12, 2009. Retrieved July 4, 2010. ^ Schwartz, Larry. "Clemente quietly grew in stature". ESPN.com. Archived from the original on February 11, 2010. Retrieved July 4, 2010. ^ "Houston's Biggio lashes 3,000th: 'Tonight is the best'". USA Today. Associated Press. June 29, 2007. Archived from the original on December 28, 2009. Retrieved July 4, 2010. ^ Marchand, Andrew (July 9, 2011). "Derek Jeter gets 3,000th hit". ESPN.com. Archived from the original on July 11, 2011. Retrieved July 9, 2011. ^ Guardado, Maria (May 4, 2018). "Breaking: Pujols joins 3,000-hit club". MLB.com. Major League Baseball. Archived from the original on May 5, 2018. Retrieved May 4, 2018. ^ Pahigian, Josh (2010). The Seventh Inning Stretch: Baseball's Most Essential and Inane Debates. Guilford, Connecticut: Globe Pequot Press. p. 80. ISBN 978-1-59921-805-2. Archived from the original on 2014-11-29. Retrieved 2016-11-02. ^ Bloom, Barry M. (April 27, 2005). "Hoffman definitely Hall of Fame caliber". MLB.com. MLB Advanced Media, L.P. Archived from the original on April 21, 2011. There are milestones in other areas that always have been instant Hall of Fame qualifiers: 3,000 hits, 500 homers and 300 wins. ^ Haudricourt, Tom (November 1999). "Hall of Fame File". Baseball Digest: 75. ^ Chass, Murray (April 16, 2000). "Baseball; Ripken Gets One More Big Number: 3,000 hits". The New York Times. Archived from the original on March 10, 2014. Retrieved July 4, 2010. ^ "Rules for Election". National Baseball Hall of Fame. Archived from the original on May 30, 2010. Retrieved July 4, 2010. ^ Erardi, John (August 23, 2009). "What is Pete Rose's true legacy?". The Cincinnati Enquirer. Archived from the original on February 22, 2014. Retrieved July 4, 2010. ^ "2014 Hall of Fame Voting". Baseball-Reference.com. Sports Reference. Archived from the original on December 19, 2012. Retrieved February 17, 2014. 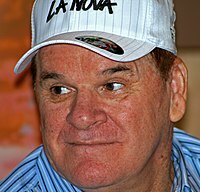 ^ "Pete Rose Statistics and History". Baseball-Reference.com. Sports Reference. Archived from the original on April 12, 2009. Retrieved July 4, 2010. ^ "Hank Aaron Statistics and History". Baseball-Reference.com. Sports Reference. Archived from the original on June 23, 2011. Retrieved July 4, 2010. ^ "Stan Musial Statistics and History". Baseball-Reference.com. Sports Reference. Archived from the original on December 3, 2010. Retrieved July 4, 2010. ^ "Tris Speaker Statistics and History". Baseball-Reference.com. Sports Reference. Archived from the original on November 27, 2009. Retrieved July 14, 2010. ^ "Derek Jeter Statistics and History". Baseball-Reference.com. Sports Reference. Archived from the original on June 29, 2011. Retrieved July 9, 2011. ^ "Honus Wagner Statistics and History". Baseball-Reference.com. Sports Reference. Archived from the original on December 3, 2010. Retrieved July 4, 2010. ^ "Carl Yastrzemski Statistics and History". Baseball-Reference.com. Sports Reference. Archived from the original on December 4, 2010. Retrieved July 4, 2010. 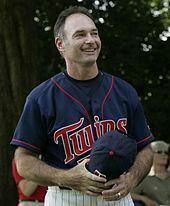 ^ "Paul Molitor Statistics and History". Baseball-Reference.com. Sports Reference. Archived from the original on April 30, 2011. Retrieved July 4, 2010. ^ "Eddie Collins Statistics and History". Baseball-Reference.com. Sports Reference. Archived from the original on April 30, 2011. Retrieved July 4, 2010. ^ "Willie Mays Statistics and History". Baseball-Reference.com. Sports Reference. Archived from the original on April 13, 2009. Retrieved July 4, 2010. ^ "Eddie Murray Statistics and History". Baseball-Reference.com. Sports Reference. Archived from the original on May 19, 2009. Retrieved July 4, 2010. ^ "Nap Lajoie Stats, Bio, Photos, Highlights". MLB.com. Major League Baseball. Archived from the original on November 4, 2012. Retrieved August 23, 2012. ^ a b "Nap Lajoie Statistics and History". Baseball-Reference.com. Sports Reference. Archived from the original on February 8, 2010. Retrieved July 4, 2010. ^ "3,000 Hits Club – Milestones". MLB.com. Major League Baseball. Archived from the original on June 24, 2010. Retrieved October 5, 2012. ^ "Cal Ripken Statistics and History". Baseball-Reference.com. Sports Reference. Archived from the original on January 4, 2010. Retrieved July 4, 2010. ^ "Adrian Beltre Statistics and History". Baseball-Reference.com. Sports Reference. Archived from the original on September 27, 2018. Retrieved September 29, 2018. ^ "George Brett Statistics and History". Baseball-Reference.com. Sports Reference. Archived from the original on April 25, 2011. Retrieved July 4, 2010. ^ "Paul Waner Statistics and History". Baseball-Reference.com. Sports Reference. Archived from the original on December 3, 2010. Retrieved July 4, 2010. ^ "Robin Yount Statistics and History". Baseball-Reference.com. Sports Reference. Archived from the original on April 27, 2011. Retrieved July 4, 2010. ^ "Tony Gwynn Statistics and History". Baseball-Reference.com. Sports Reference. Archived from the original on April 30, 2011. Retrieved July 4, 2010. ^ "Alex Rodriguez Statistics and History". Baseball-Reference.com. Sports Reference. Archived from the original on July 12, 2010. Retrieved June 19, 2015. ^ "Dave Winfield Statistics and History". Baseball-Reference.com. Sports Reference. Archived from the original on April 30, 2011. Retrieved July 4, 2010. ^ "Albert Pujols Statistics and History". Baseball-Reference.com. Sports Reference. Archived from the original on July 7, 2009. Retrieved May 5, 2018. ^ "Ichiro Suzuki Statistics and History". Baseball-Reference.com. Sports Reference. Archived from the original on May 18, 2009. Retrieved August 7, 2016. ^ "Craig Biggio Statistics and History". Baseball-Reference.com. Sports Reference. Archived from the original on December 3, 2010. Retrieved July 4, 2010. ^ "Rickey Henderson Statistics and History". Baseball-Reference.com. Sports Reference. Archived from the original on December 3, 2010. Retrieved July 4, 2010. ^ "Rod Carew Statistics and History". Baseball-Reference.com. Sports Reference. Archived from the original on October 15, 2012. Retrieved July 4, 2010. ^ "Lou Brock Statistics and History". Baseball-Reference.com. Sports Reference. Archived from the original on March 22, 2010. Retrieved July 4, 2010. ^ "Rafael Palmeiro Statistics and History". Baseball-Reference.com. Sports Reference. Archived from the original on April 30, 2011. Retrieved July 4, 2010. ^ "Wade Boggs Statistics and History". Baseball-Reference.com. Sports Reference. Archived from the original on April 30, 2011. Retrieved July 4, 2010. ^ "Al Kaline Statistics and History". Baseball-Reference.com. Sports Reference. Archived from the original on June 29, 2011. Retrieved July 4, 2010. ^ "Roberto Clemente Statistics and History". Baseball-Reference.com. Sports Reference. Archived from the original on July 22, 2017. Retrieved July 30, 2017.